18 publications with the keyword "cell segmentation"
Human epithelial (HEp-2) cell specimens is obtained from indirect immunofluorescence (IIF) imaging for diagnosis and management of autoimmune diseases. 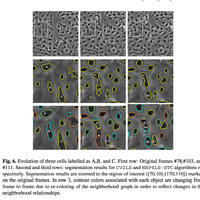 Analysis of HEp2 cells is important and in this work we consider automatic cell segmentation and classification using spatial and texture pattern features and random forest classifiers. In this paper, we summarize our efforts in classification and segmentation tasks proposed in ICPR 2016 contest. 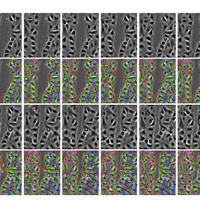 For the cell level staining pattern classification (Task 1), we utilized texture features such as rotational invariant co-occurrence (RIC) versions of the well-known local binary pattern (LBP), median binary pattern (MBP), joint adaptive median binary pattern (JAMBP), and motif cooccurrence matrix (MCM) along with other optimized features. We report the classification results utilizing different classifiers such as the k-nearest neighbors (kNN), support vector machine (SVM), and random forest (RF). 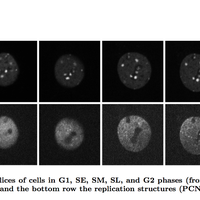 We obtained the best mean class accuracy of 94.29% for six cell classes with RIC-LBP combined with a RIC variant of MCM. For specimen level staining pattern classification (Task 2) we utilize a combination RIC-LBP with RF classifier and obtain 80% mean class accuracy (MCA) for seven classes. 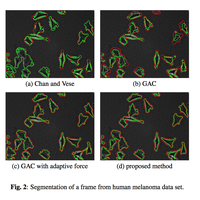 For cell segmentation (Task 4), we use our optimized multiscale spatial feature bank along with RF classifier for pixelwise labeling to achieve an F-measure of 84.26% for 1008 images. V. B. S. Prasath, Y. M. Kassim, Z. A. Oraibi, J.-B. Guiriec, A. Hafiane, G. Seetharaman, and K. Palaniappan. 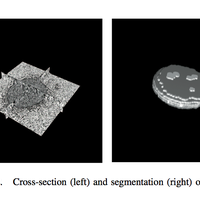 HEp-2 cell classification and segmentation using motif texture patterns and spatial features with random forests. Proc. IEEE International Conference on Pattern Recognition (ICPR), December 2016. Physiological properties of blood flow at the microvasculature scale can be measured by tracking the movement and density of red blood cells (RBCs). In this paper we propose a method for individual RBC segmentation to enable tracking and capturing dynamically varying bulk transport properties. RBCs have varying annular and disk like morphologies, and are often clustered into clumps that are difficult to segment using watershed-based methods. Edge profile active con- tours in combination with graph coloring based coupling (C-EPAC) are introduced as a robust approach to prevent merges between ad- jacent, clumped RBCs by modifying the active contour energy func- tion to be sensitive to a specific edge profile and not just the mag- nitude as in the traditional methods. Explicit coupling is combined with graph coloring to efficiently compute the contour evolution us- ing the fewest number of level sets to support high-throughput stud- ies of RBC flow characterization under varying physiological condi- tions. I. Ersoy, F. Bunyak, J. Higgins, and K. Palaniappan. 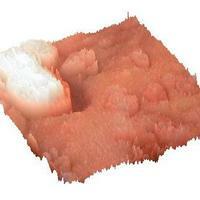 Coupled edge profile geodesic active contours for red blood cell flow analysis. IEEE Int. Symposium on Biomedical Imaging (ISBI), 2012. Fluorescently tagged proteins such as GFP-PCNA produce rich dynamically varying textural patterns of foci distributed in the nucleus. This enables the behavioral study of sub-cellular structures during different phases of the cell cycle. The varying punctuate patterns of fluorescence, drastic changes in SNR, shape and position during mitosis and abun- dance of touching cells, however, require more sophisticated algorithms for reliable automatic cell segmentation and lineage analysis. 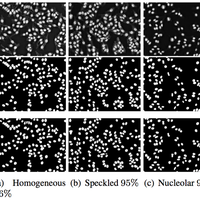 Since the cell nuclei are non-uniform in appearance, a distribution-based modeling of foreground classes is essen- tial. 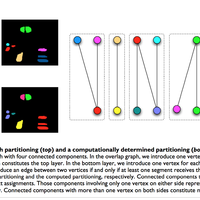 The recently proposed graph partitioning active contours (GPAC) algorithm supports region descriptors and flexible distance metrics. We extend GPAC for fluorescence-based cell segmentation using regional density functions and dramatically improve its efficiency for segmentation from O(N4) to O(N2), for an image with N2 pixels, making it practical and scalable for high throughput microscopy imaging studies. F. Bunyak, K. Palaniappan, V. Chagin, and M. C. Cardoso. 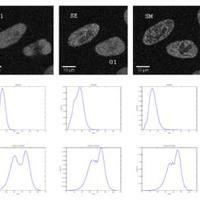 Cell segmentation in time-lapse fluorescence microscopy with temporally varying sub-cellular fusion protein patterns. 31st IEEE Engineering in Medicine and Biology Society Conf. (EMBC), pages 1--5, 2009. Current chemical biology methods for studying spatiotemporal correlation between biochemical networks and cell cycle phase progression in live-cells typically use fluorescence-based imaging of fusion proteins. Stable cell lines expressing fluorescently tagged protein GFP-PCNA produce rich, dynamically varying sub-cellular foci patterns characterizing the cell cycle phases, including the progress during the S-phase. Variable fluorescence patterns, drastic changes in SNR, shape and position changes and abundance of touching cells require sophisticated algorithms for reliable automatic segmentation and cell cycle classification. We extend the recently proposed graph partitioning active contours (GPAC) for fluorescence-based nucleus segmentation using regional density functions and dramatically improve its efficiency, making it scalable for high content microscopy imaging. We utilize surface shape properties of GFP-PCNA intensity field to obtain descriptors of foci patterns and perform automated cell cycle phase classification, and give quantitative performance by comparing our results to manually labeled data. I. Ersoy, F. Bunyak, V. Chagin, M. C. Cardoso, and K. Palaniappan. 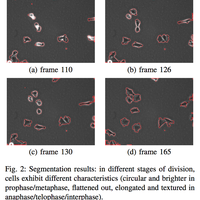 Segmentation and classification of cell cycle phases in fluorescence imaging. Lecture Notes in Computer Science (MICCAI), volume 5762, pages 617--624, 2009. The first step in cell behavior analysis is cell detection. Cell detection returns an initial contour close to actual cell boundaries, that is later refined by the cell seg- mentation process. 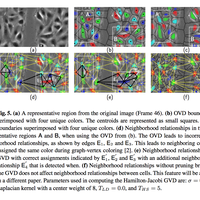 A wide range of techniques have been applied for detecting and segmenting biological objects of interest in video microscopy imagery includ- ing spatially adaptive thresholding, morphological watershed, mean shift, active contours, graph cuts, clustering, multidimensional classifiers like neural networks, and genetic algorithms. Various factors such as type of the cells, environmental conditions, and imaging characteristics such as zoom factor affect the appearance of cells, and thus choice of detection method. But in general, features used in cell detection can be grouped into three categories: intensity-based, texture-based, and spatio-temporal features. 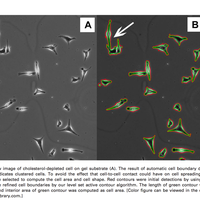 Intensity-based detection approaches (i.e., intensity thresholding [1, 2] or clustering ) are suitable for lower resolution or stained images where cells or nuclei appear semi-homogeneous and have distinct intensity patterns compared to the background. For high-resolution unstained images where interior of the cells appear highly heterogeneous or where interior and exterior in- tensity distributions are similar, features based on spatial texture (i.e., ridgeness measures in ) or features based on spatiotemporal features or motion are needed. In the following section, we describe the flux tensor framework for accurate detection of moving objects (which in this context correspond to moving cells) in time lapse images that effectively handles accurate detection of nonhomoge- neous cells in the presence of complex biological processes, background noise, and clutter. 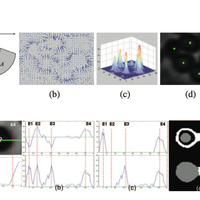 keywords = "parallelization, gpu, cell detection, cell segmentation, cell tracking, machine learning, biomedical"
K. Palaniappan, F. Bunyak, S. Nath, and J. Goffeney. Parallel processing strategies for cell motility and shape analysis. 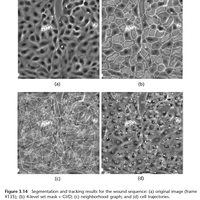 High-Throughput Image Reconstruction and Analysis, Artech House Publishers, pages 39--85, 2009. Background: With the increasing availability of live cell imaging technology, tracking cells and other moving objects in live cell videos has become a major challenge for bioimage informatics. 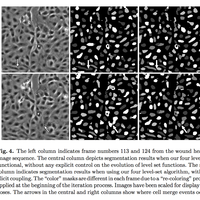 An inherent problem for most cell tracking algorithms is over- or under-segmentation of cells – many algorithms tend to recognize one cell as several cells or vice versa. 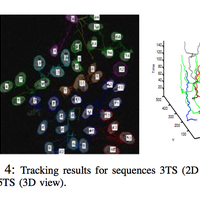 Results: We propose to approach this problem through so-called topological alignments, which we apply to address the problem of linking segmentations of two consecutive frames in the video sequence. Starting from the output of a conventional segmentation procedure, we align pairs of consecutive frames through assigning sets of segments in one frame to sets of segments in the next frame. We achieve this through finding maximum weighted solutions to a generalized "bipartite matching" between two hierarchies of segments, where we derive weights from relative overlap scores of convex hulls of sets of segments. For solving the matching task, we rely on an integer linear program. Conclusion: Practical experiments demonstrate that the matching task can be solved efficiently in practice, and that our method is both effective and useful for tracking cells in data sets derived from a so-called Large Scale Digital Cell Analysis System (LSDCAS). 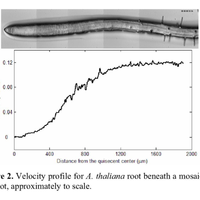 A. Mosig, S. Jaeger, W. Chaofeng, I. Ersoy, S. K. Nath, K. Palaniappan, and S. Chen. 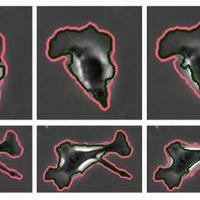 Tracking cells in live cell imaging videos using topological alignments. Algorithms in Molecular Biology, volume 4, pages 10p, 2009.